An interesting one-day conference was hosted by IFM and the Hub on Friday 22nd February. 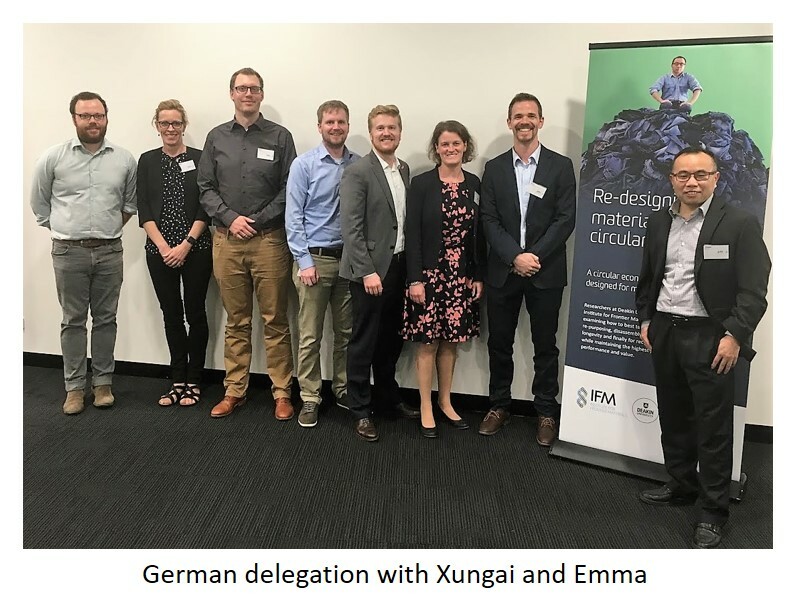 The conference was organised by a visiting delegation from the Institute for Bioplastics and Biocomposites, Hochschule Hannover, as part of a German government funded initiative designed to grow an international network on bioeconomy research. The delegation also included colleagues from Technical University Braunschweig, Fraunhofer Institute for Wood Research and VAUDE – an outdoor outfitter company. The visitors gave an introduction to bioplastics, sharing market data and end-of-life management, before delving into some of the research projects they are undertaking including processing, bio-based hybrid materials and marine degradation. Presenters from the Australian side included Peter Allan from Sustainable Resource Use speaking about the plastic market in Australia, Menghe Miao from CSIRO on biofibre products, and IFM’s Nolene Byrne on textile recycling. The informal afternoon interactive sessions featured industry insight from VAUDE who have a strong commitment to sustainability, and an overview on bioeconomy policies in Germany and Europe. A follow-up meeting on Monday focussed on discussions of potential areas for collaboration, and brainstorming ideas for possibly Horizon2020 funding applications. As the bioeconomy gains more recognition in Australia we look forward to further developing collaborations with these visiting researchers.